I was watching Martha Stewart last week (as I always do!) and she had a beautiful spring craft on that I thought would be absolutely perfect for weddings! She created stunning fabric floral bouquets and it seemed pretty simple to do too. 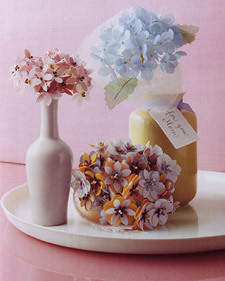 I’m definitely tempted to add another project to my growing list of diy things for my July wedding…fabric hydrangeas! Begin by punching your fabric flowers: Lay a piece of fabric in a shallow tray. With a medium paintbrush, apply enough fabric stiffener to saturate, but not soak, the fabric. Let it dry, about 1 hour. Repeat with any remaining fabric. Using craft punches, punch out petals and leaves as close together on the fabric as possible. Using a micro hole punch, make a hole in the center of each bloom. Slip a pip through each hole, and secure it with a dab of contact cement. To make a stem, cut a length of floral wire, and wrap it around each pip with green floral tape. For leaves, glue floral wire to each one to create veins and stems. Wrap stems with floral tape. Gather blooms and leaves into a bouquet, and either tuck them in a vase or wrap the stems in more floral tape to join them. If using a comb gently sew your flowers to it with needle and thread, reinforcing with a dab of strong glue (hot glue maybe?) if you like. If using pins place flowers where u want them at the top of the pin and glue with strong glue. There you go! with those easy instructions you can fill your ceremony and reception with your own handmade bouquets and centerpieces that will last forever! Beautiful keepsakes you will cherish. The hair pieces would also look good not only in your bridal hair..but your bridesmaids and flowergirl’s hair too!